New thread for the new season. After another fine season in the north-west, De Gea’s incredible save to deny Almen Abdi against Watford in November was selected as Match of the Day’s save of the season. Astonishingly, it is the fourth consecutive year in which the United ‘keeper has won the award – meaning he has been given the prize every single year since it opened in 2013. David De Gea has been crowned Sir Matt Busby Player of the Year for 2015/16, becoming the first player to win the coveted award in three consecutive seasons. 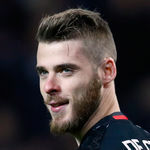 Manchester United goalkeeper David De Gea has been named in the PFA Team of the Year for the third time in his career. Give him the captain's armband. He deserves it. 3 incredible seasons and looks like he is here for the foreseeable future. Testament to another season of completely outrageous saves that I'd forgotten that one vs Watford that won save of the season. As if he's won that award 4 years in a row. First goalkeeper in EPL history to be in the team of the season, 3 years in a row of I'm right? Crofton now say is he see his long term future here and the door is closed on Madrid. Will go down as a legend, I'm sure of it. He is also redefining how one evaluates goal keepers. Nowadays, when other keepers let one in, i go "difficult save but think Dave would have done better". One of our best ever players, let alone goalkeepers. Best keeper in the world for me.. Never seizes to amaze.. He's the best I've seen. He's always seizing on the ball, I like that he rarely punches from crosses unless he has to. Uses his legs a lot too, hope they don't seize up when we're dominating and he has nothing to do next season. Arguably, he is. I'm still undecided, but I wouldn't scoff at anyone saying he's better than Schmeichel. Schmeichel was better though; which isn't a slight on him at all. I wonder if he's played handball? Because the way he uses his feet reminds me of that. Used to play myself, even in goal, and you go down in similar way he does. Still think Neuer is marginally better. I think Dave needs to work more on his command of the box. Dave is streets ahead of anyone these days. Don't think he's streets ahead but he's ahead. Best goalkeeper in the world for me and arguably the best goalkeeper we've had at the club. Looking forward to seeing him next season! Can not believe we managed to hold on to him. Woodie played a blinder there. Sorry mate I couldn't resist. No problem.... It was funny as feck..
People seem to grossly over emphasise a keepers ability with the ball at feet these days. Of course it's part of being a modern keeper but ultimately your GK is there to prevent the team conceding, reflexes and shot stopping is far more important. DDG is comfortably the best shot stopper in the world right now. A few years ago, I had a dream where I was at Carrington during a Utd training and SAF said to me "That de Gea... he saves goals!" This was after a really long trip for me when I had to cross a sea in a canoe. It was at the time when the media were calling for Dave's head. I like to believe I played my part in him becoming the best keeper in the world. I think he meant organising and coordinating his defenders. EDIT: Nevermind, I see you're addressing the first point. What were his 3 other winning saves? I can remember when plenty argued Courtois was the better keeper not 3 seasons ago. Command of the box and distribution along with organising your defence are also key aspects. Overall, I believe De Gea is ahead but not "miles" ahead - just ahead of Neuer. True but I don't think Neuer is exactly leaps and bounds ahead in that department either. DDG is more passive but will naturally make fewer mistakes too, Neuer has a fumble in him under physical pressure. Sad that we've never had a full settled defence in front of him. Silly to see Reina and Hart with 7 Golden Gloves between them and De Gea with none. You make it sound like he left while never having a great defense in front of him. We now have Mourinho, huge difference. I don't want to worry anyone but I had a dream that we sold Dave to Real Madrid for £5.8m. During the day it then came out that the nominal fee was agreed as part of a deal that Madrid would give us a free run at Pogba. Fully expected him to be in Madrid by now. Huge bonus this. One of the best keepers in the world that seems to improve with every goal keeper coach. I wonder what he will add to his repertoire this year. Pitchforks are ready at your home's front entrance. I don't quite understand what the De Gea has good feet thing is? His distribution is not even close to his shot-stopping skills. In fact, it's quite poor. His long passes always seem to end up outside. Romero however, is quite good at it, but not as good a shot-stopper. Funnily enough when he first came to United, he's kicking was flawless. It has since regressed.